Therizinosaurus Claw. Dinosaur fossil replica. 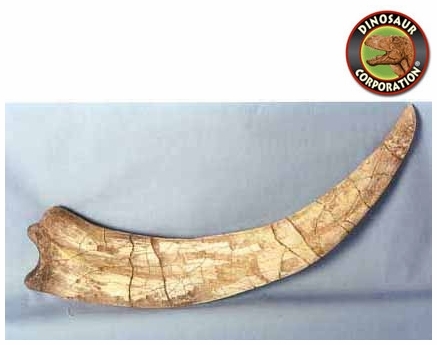 A shortened model of the particularly elongated record 28-inch claw from the rare dinosaur of Cretaceous Khazakistan and inner Mongolia. Therizinosaurus is a genus of very large theropod dinosaurs. Therizinosaurus comprises the single species T. cheloniformis, which lived in the late Cretaceous Period (late Campanian-early Maastrichtian stages, around 70 million years ago), and was one of the last and largest representatives of its unique group, the Therizinosauria. Fossils of this species were first discovered in Mongolia and were originally thought to belong to a turtle-like reptile (hence the species name, T. cheloniformis � "turtle-formed"). It is known only from a few bones, including gigantic hand claws, from which it gets its name.